Normandy : House with a sea view. House with a nice garden and a sea view. 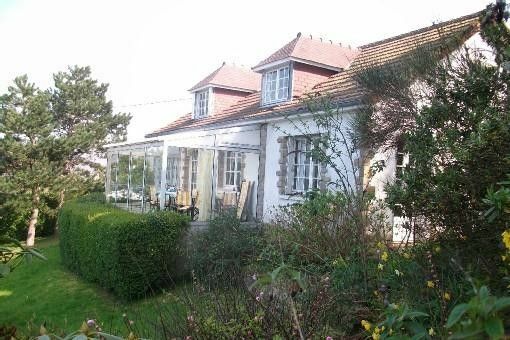 At about 11 km from Cherbourg, a 150 m2 house in a 2000 m2 garden, to rent from saturday to saturday. The house has a gorgeous sea view from Cherbourg harbor's old fortifications to the lighthouse of Fermanville. The beach is at a 5' walk , a nice sea path leads to the small Fermanville harbor. The 34 m2 living room has a usable fire place , there is a spacious veranda facing the sea and a small office .There are 4 bedrooms , 2 toilets , a bathroom with a shower , and a small veranda at the entrance serving as a hall way and a garage.There are lots of possible walks along the sea shore and in the nearby woods.Le Mont Saint Michel is at a a 1 hours drive , Tatihou Island is at a 30 minutes drive . There is an outdoor barbecue and Canal Satellite . On the first floor there are 3 bed rooms. One with a single bed ,another one with a double bed and a single bed and another one with a double bed.There is a small bathroom with a simple washing basin . toilets. Up the garden there is a garage. The ground is separated into 2 parts : one surrounding the house with flowers and a small terrace sheltered by edges and an upper part which is planted with pinetrees. The whole is about 1,500 m2 . We are a couple of teachers, living in Paris. The house as a gorgious sea view,. It is surrended by a 1500 meter garden. The upper part is planted with pine trees, the lower part is planted with roses, apple trees, and flowers. Two bath rooms. One at the ground flour, with a shower, the other, up stairs, with a lavabo. An office with a desk. 2 toilets , a small veranda at the entrance, a large veranda facing the sea, a garage. The duvets are available. canal-satellite, a DVD player. : various channels (canal-satellite). Beach toys, a pneumatic small boat, two surfboards, and a wind board available. A barbecue. Rustic very French detached house with stunning views. We stayed last year in this charming 4 bedroom cottage with spacious gardens and a conservatory with the most amazing views imaginable. 100 metres up the road (2 minutes) is a viewpoint where you can view the whole of the English channel. The area in question is littered with WW2 look out bunkers which our kids loved exploring. 5 minutes walk down the road there is a wonderful tidal beach great for paddling or watersports. Owner was very accommodating with boat an dinghy available for guests to use. Camp shop 5 minutes walk where basic groceries are available and yesterdays English paper! Lovely area, an absolute beauty spot and well located. There are farmers markets daily in different towns within 20 minutes drive, and there are loads of coves and unspoilt beaches within minutes. On rainy days there is a lovely swimming pool 5 minutes drive and the Cherbourg Ferry port is less than 15 minutes away. Loads of stunning walks from the cottage and we will probably return some time soon. Possibilities in the surroundings : The Anse du Brick beach at a 300 m walk , a wood at about 300 m , a footpath along the seashore which leads to small harbors , lots of nice sightseeings are possible: Tatihou island, Saint-vast-la-hougue, Barfleur. The Mont-Saint-Michel at a two hours drive. La maison n'est proposée à la location que dans la période de printemps à l'automne, soit du premier Avril au 30 Octobre. La saison haute est du 1er Juin au 15 Septembre.. En basse saison la semaine est de 800 euros, les nuitées sont de 130 euros en haute saison. Un forfait de cinquante euros est prévu, si vous ne voulez pas faire le ménage en partant. Un chèque de caution de 200 euros demandé..